The topic of data science has been on the rise within the tech industry. Often, we see techies conversing and sharing articles about data science on social media and we hear professionals discussing it as part of their business plan. By now, most of us are aware that it exists and have an inkling about what it does. But can you answer the following questions? In the past, it has been known that larger, technologically advanced companies used data scientists (Facebook, LinkedIn, Google, etc.). However, we are seeing non-technology type businesses hire data scientists. For example, retailers are using data science for everything from understanding customers to managing inventory. 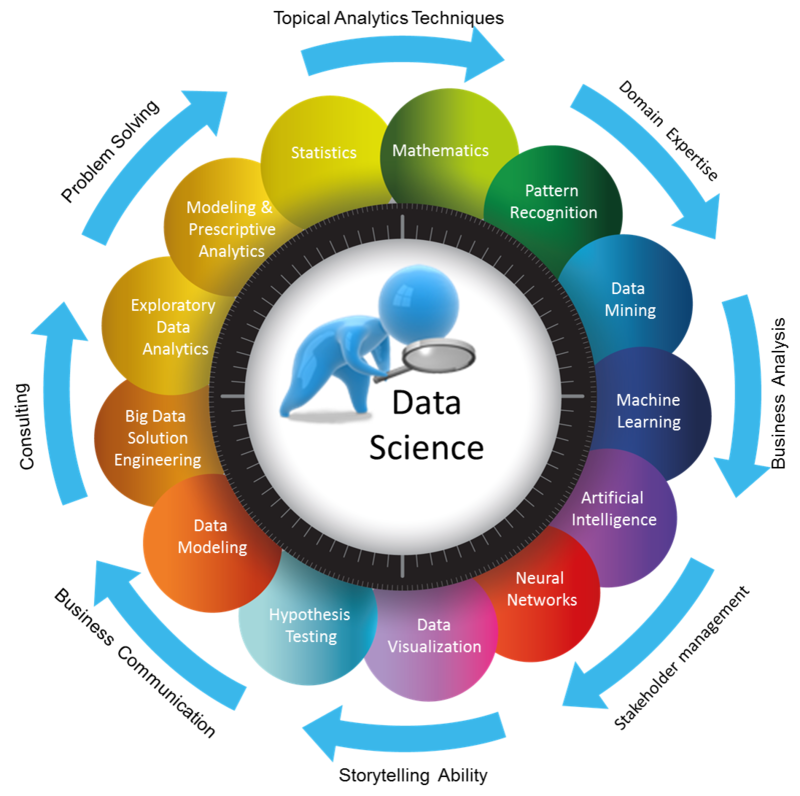 Data science allows companies to gain insights from data in many fields and ultimately improve forecasting and decision making. According to Dr. Steve Hanks, there are three major capabilities that data scientists must have: (1) They must understand that data has meaning, (2) They must understand the problem that you need to solve and how the data relates to that, and (3) They must understand the engineering. A data scientist, in very general terms, looks at and investigates a set of data and then comes up with different ways to answer previously posed questions. Along the way, the data scientist may consider historical data analysis to develop analytical models and dashboards that provide insights and improve decision making.For example, a data scientist for a large retailer like Macy’s may look at not just past seasons’ data, but current economic and weather conditions to make predictions for their upcoming season. Retail executives make use of this to improve things such as sales, revenue, marketing strategies, advertising efforts, etc. How Do You Build a Strong Data Science Team? Choosing people that are aware and skilled in areas that fit your company’s need is essential. An article from Datafloq says, “The team needs to take the data and understand how it can affect different areas of the company and help those areas implement positive changes.” Not all the skills of a data scientist can be taught; it is important to have a natural affinity for data analytics, and the drive to produce beneficial insights to answer your company’s needs.Data scientists are not only computer scientists and statisticians, but must have a solid understanding of the business as well. Should You Outsource Your Data? Because this field of work is both complex and intimidating, there is a shortage of skilled professionals in the industry. Advanced analytics require a certain skill-set to develop and run machine learning models. Instead of spending the money and putting in the efforts to develop a team with the necessary skills internally, you can speed up your path to data science and outsource. For small-to-medium businesses, it can be cost-prohibitive to have their own data science team. There is work in the field of data engineering that must be done before a data scientist can develop models. This may not be an efficient use of resources for a small-to-medium business to hire both data engineers and data scientists. If you’re overwhelmed by these questions, don’t be. Although the idea of data science and big data may seem complex, it is important to understand at least the basics. If you can articulate your business pain-points, it will be easier to answer these questions and find the best solutions to fit your company’s needs. Orzota is here to explain further, answer your questions, and offer services to help you feel comfortable with understanding and fulfilling your data science needs.